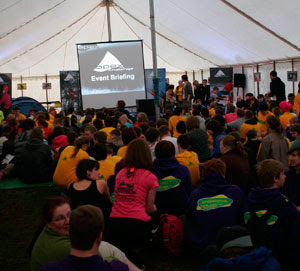 After just three weeks 80 teams have already entered this Autumn's Apex Extreme. It means the race is now on for those teams that have entered to confirm their places. We've already had cheques in from more than 60 teams so there's really not long left if you want to be certain of one of the remaining places in this year's event which is taking place on the weekend of 8th - 10th October in the Peak District. The only way to confirm your place is to get your cheques to Apex HQ to cover your entry fees and any T-shirts you would like to order. It's important to remember that registering your team is not enough to guarantee your place in the event. If your team is currently listed on the Provisional Team List page it means we haven't yet received your cheque and it is still possible for other teams to confirm their places first. Once 80 teams have confirmed their places then the event will be closed to any other entrants. For those of you who are taking part, we'll be announcing more details about the event over the next few weeks. Keep checking back here!